The International Coordinating Committee of the International League of Peoples’ Struggle (ICC-ILPS) held its plenary meeting on March 17-18, 2018. The ILPS Chairperson, Prof. Jose Maria Sison, opened the meeting and welcomed all those present, including those on Skype. The roll call was made and a quorum was confirmed. The ICC members physically present were: Prof. Jose Maria Sison, Len Cooper, Malcolm Guy, Florentino Lopez Martinez, Antonio Tujan, Veerle Verscheuren, Bill Dores, Ramon Bultron, Berna Ellorin, Paloma Polo, Pascual Duarte and Samuel Villatorro. The following stood as proxies: Susan Cruz for Liza Maza, Fidel Agcaoili for Elmer Labog, and Tatiana Lukman for Rudi ¬¬¬¬Daman. Malem Ningthouja participated through Skype. The agenda was presented and approved. The minutes of the meeting were reviewed and approved after a number of corrections were made. Reports were made by the Executive Officers of ICG/ICC, the different ILPS commissions, global region committees and national chapters. The ILPS Chairperson, Prof. Jose Maria Sison, made his report. As spokesperson of the League, he put forward the position of ILPS to address various important developments in the world such as the US-led wars in the Middle-East, the transfer of the US embassy to Jerusalem, Turkey’s invasion of Afrin, US threats against the Democratic People’s Republic of Korea (DPRK) and others. He also issued solidarity messages to events of ILPS member organizations and ILPS allies. He informed the body of appointments of certain people to represent the Chair in conferences and to perform certain tasks such as the expansion of ILPS in the former Soviet Republics and Eastern Europe and so on. He also informed the body about some steps taken to streamline the support staffs for the Chair and the General Secretary. The Vice-Chairperson for Internal Affairs in his report presented a general picture of the status of the work and functioning of the commissions. He pointed to the need to take decisive and effective measures to revitalize the commissions. The Vice-Chairperson for External Affairs gave his report. He reported on the progress in the organizational consolidation of ILPS in Latin America and the expansion of the ILPS organization and influence in the region. The General Secretary gave his report on the status of the work and organization of the General Secretariat in relation to internal and external communications, maintaining the website, publication of a newsletter, storage of records and publications. He also informed the body about measures to clarify the division of tasks between the members of the General Secretariat: General Secretary, the two deputies, the Treasurer and the heads of the support staffs of the Chair and General Secretary. The Treasurer gave her report. She informed the ICC that ILPS has a positive balance. The problem of collecting the membership dues remains. The ILPS has opened a new bank account. Commissions 2, 5, 10 and 12 submitted written reports on their work and plans. The VCIA gave an oral report on the work and plans of commissions 1, 6, 8 and the Commission on the Homeless. The ASPAC Global region committee gave a report on the developments of the work in the region. 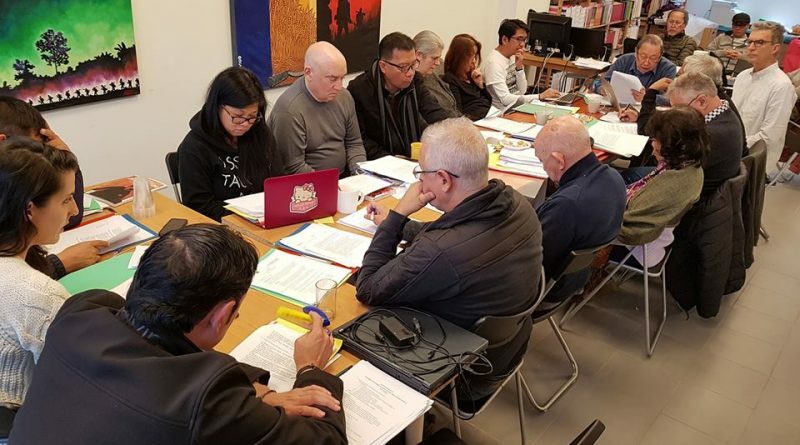 The various national chapters also gave their reports on the objective situation in their countries, the status of the ILPS organization, past and present campaigns and struggles, and future plans : Australia, Argentina, Guatemala, Indonesia, Mexico, Philippines, US, Canada, Senegal. One ICC member in Europe reported on the activities of ILPS organizations in Europe. The ICC made the final decision to hold a 4-day 6th International Assembly (6thIA) in Hong Kong on June 23-26, 2019 after taking into account the important political and organizational considerations. Recognizing the importance of ILPS presence in Latin America, the ICC shall support a major event to be organized by the ILPS in Latin America. The event can lay the ground for the establishment of the global region committee for Latin American. The Vice-Chairperson for Internal Affairs presented a list of different campaigns, conferences and seminars on various issues and struggles. Youth Camp in Mexico on July 30-Aug 5, 2018. To use new communications technologies (Zoom) for ICC, ICG and other global meetings of ILPS. The ICC appointed Mustafa Kilinc as the new ILPS Auditor after it accepted Lyn Meza’s resignation for health reasons. The ICC set the next ICG meetings on September 22, 2018 and February 15, 2019 and the next ICC meeting on February 16-17, 2019 in Utrecht.